It’s been a rough three years for Chipotle, which still hasn’t recovered from its 2015 food-safety issues. Sales are down, consumer confidence hasn’t recovered, and to put it plainly, all is not well in burritoville. But the company has a new idea it thinks might help send things in a more positive direction. That direction is around the building, in a kind of half loop. CNBC reports that Chipotle is actively looking to get into the drive-thru scene, though not in a way you might expect. These drive-thru lanes, which are already available in five stores—two in Ohio, one each in Tennessee, Texas, and Massachusetts—are intended for pick-up only. That means there’s no giant glowing menu with a microphone you have to shout at. If you want to use the Chipotle drive-thru, you have to order through the app or online. You’ll then get a designated pickup time, and when you arrive, Chipotle hopes to make the process as painless as possible. 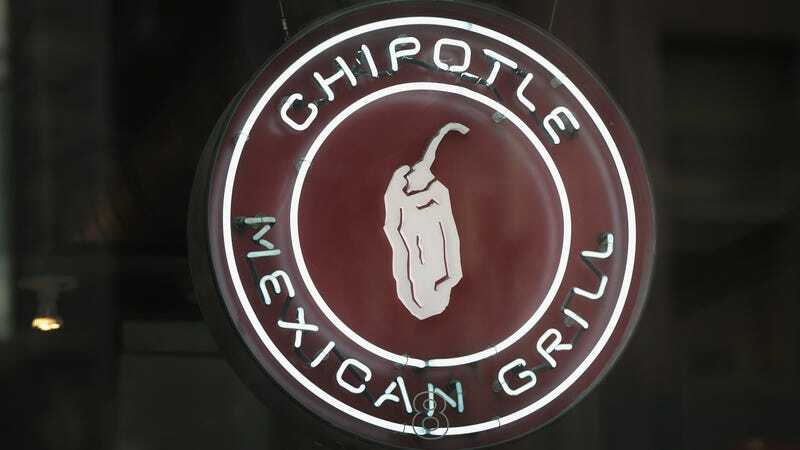 For Chipotle, that means adding things like dedicated parking spaces for mobile users who arrive before their order is prepared and texting customers when the meal is ready to be picked up. To be honest, we at The Takeout were prepared to roll our eyes at this a bit, but it actually makes sense. Online ordering can be off-putting for some if there’s no dedicated pickup location, and it’s not unusual for people who’ve ordered ahead to end up waiting in line anyway. Making it even easier to grab your burrito bowl and vamoose seems like a pretty winning strategy. A drive-thru Chipotle (Drive-Thr-otle?) is expected to open in Virginia by the end of 2018. Why can&apos;t we forgive Chipotle?